The question shouldn’t be what can you do with baking soda. Instead, ask what can’t you do with baking soda! Baking soda has so many ways it can be used from baking (obviously), personal care, cleaning and more. 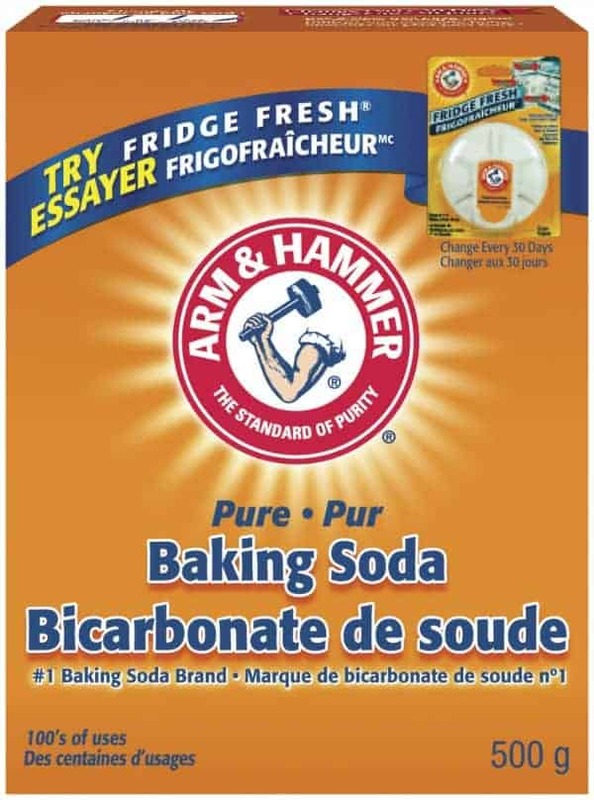 I always keep several boxes of Arm & Hammer™ Baking Soda in my pantry. It’s one item you never want to run out of. And it’s also affordable and readily available. A win-win. If you ever run out of your cleaner, try using baking soda instead to get the job done. There are many, many ways to clean with baking soda. I’ve listed out 20 ways to clean with baking soda. From regular cleaning tasks that you do daily to less frequent jobs, baking soda can help you get the job done effectively. 1. Clean your tub, tiles and sinks. Sprinkle baking soda on a damp sponge and scrub away. Rinse the surface with water and wipe dry. 2. Deodorize garbage cans. Sprinkle baking soda inside your garbage cans around the house. 3. Clean garbage cans. Wash your garbage cans with a solution consisting of 1 cup baking soda and 4 cups of water. 4. Clean vinyl shower curtains. Sprinkle baking soda on a damp sponge and scrub the shower curtain. Rinse off and hang it up to dry. 5. Deodorize sink and bathtub drains. Stop smelly odours and prevent new ones from coming up. Dump 1/2 cup of baking soda down the drain while running a stream of warm water. 6. Clean bathroom tiles. Clean your bathroom tiles on the floor or in the bathtub with a solution of 1/2 cup of baking soda in a bucket of warm water. Mop or scrub as normal, and then rinse clean. 7. Clean marks on walls and furniture. Apply baking soda to a damp sponge and rub lightly on the surface. Wipe off with a clean, dry cloth. 8. Eliminate carpet odours. Add baking soda directly on your carpet. Wait 15 minutes and vacuum as normal. 9. Freshen closets. Place an open box of baking soda in the closet just like you would in a fridge. Replace it every 30 days. 10. Remove musty smell from towels and linen. Add 1/2 cup baking soda to the rinse cycle in your washing machine. 11. Freshen upholstery. Sprinkle baking soda to your chairs and couch. Wait 15 minutes before vaccuuming up. 12. Keep the fridge smelling fresh. Place an open box of baking soda on a shelf in your fridge. Remember to replace the box every 30 days. 13. Cut grease on dishes. Add two tbsp of baking soda to your dishwater. Leave your greasy dishes to soak for 15 minutes before cleaning. 14. Freshen the dishwasher. Sprinkle baking soda on the bottom of your dishwasher and leave it there. Continue on as normal with your dishes. 15. Clean surfaces in your kitchen. Sprinkle baking soda on a damp cloth and scrub your counters sink, range hoods, etc. Rinse thoroughly with water and pat dry. 16. Freshen stinky sponges. Soak your cleaning sponges in a solution of 4 tbsp baking soda and 4 cups of warm water. 17. Polish silverware. Make a baking soda paste with 3 parts baking soda to 1 part water. Rub the paste onto your silverware with a clean cloth. Rinse completely and dry to shine it up. 18. Freshen a stinky gym bag. Sprinkle baking soda into your gym bag to absorb foul odours. 19. Freshen cat litter. Cover the bottom of your cat litter box with baking soda. Then cover with cat litter as normal. 20. Boost your laundry for cleaner, brighter clothes. Add 1/2 cup of baking soda to your washing machine when you add your liquid detergent. 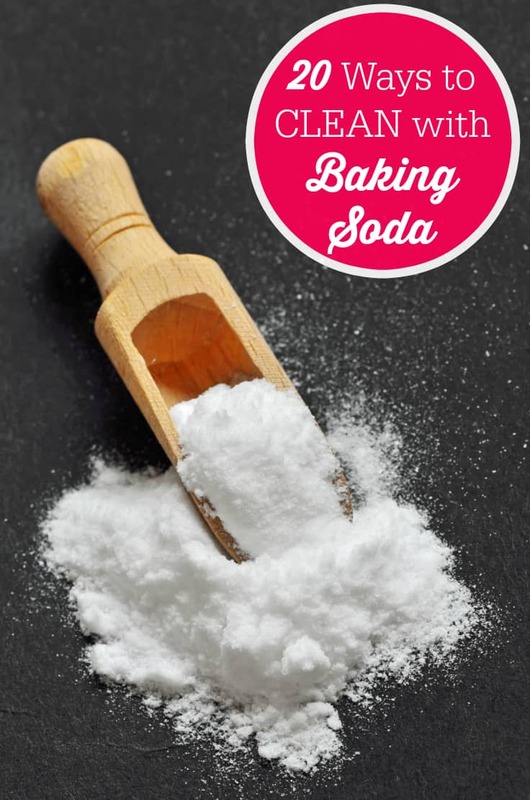 Want more ways to use baking soda in your home? Check out this huge list of ideas on Arm & Hammer! Do you use baking soda to clean your home? I’ve only used it for #1, 7, and 12 (and baking of course!). There are a lot of uses! I can’t believe all the cleaning you can do with baking soda! Can’t wait to try a few! I wash my face w/ baking soda! Seriously, it’s the best cleanser! Baking soda in our laundry routine, bonus! Very helpful post, I have been using baking soda a lot more for cleaning! We use baking soda to deodorized the litter box. Definitely gonna try some of these ideas! After reading this, I can quickly see baking soda becoming my best friend. I have tried a lot of these ideas before. Baking soda is soooo useful for so many things. These are all great ways to clean with baking soda, we use baking soda in our refrigerator and freezer, it helps to keep things fresh. Thank you for sharing these tips. I was aware of some of these, but others are new to me. These are really great uses and tips to have around the house. I knew baking soda had a lot of uses but I didn’t know it had this many uses! Thanks for the list.